Remember when you were in grade school and you learned how to write invisible notes with lemon juice? 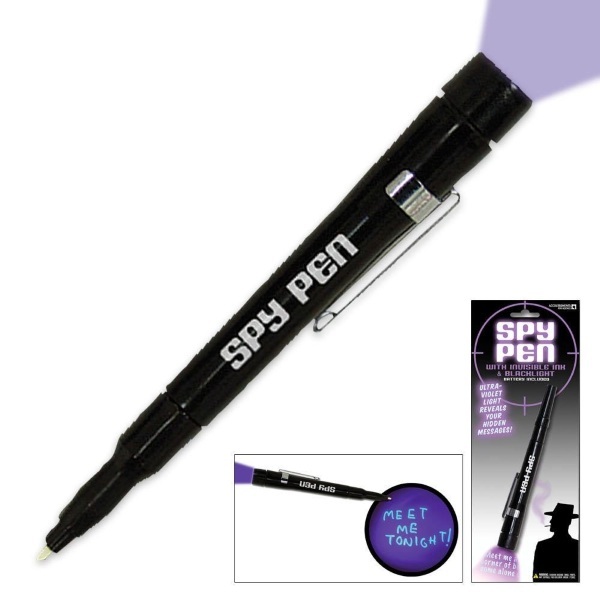 Step up your secrecy game with the Spy Pen, an invisible ink pen and black light combo. There are a million and one ways to send secret data but for those who are still in love with handwriting and good old fashioned paper, check out this little combo. One end is the pen, which is a bit more like a marker, that you use to write your note. The other end is an ultraviolet light that you use to see the invisible missives. Make secret shopping lists or leave important information for friends and family without worrying that your foes will catch on to you. It has a ton of silly uses and almost no practical ones but not everything needs to be serious, right? The pen comes with a battery so you can get right down to your important spy business. The Spy Pen is $10.95.